It was a beautiful day today. Even though it's been warm, you can autumn is here by the beautiful crispness of the air, the presence of a breeze, and the amazing clarity of the light. Early autumn is my favourite time for enjoying long walks on nearby beaches and in local rainforests. I always get a hankering to buy land and build a new house around this time of year too, I'm such an itchy foot. Let me show you something else that's beautiful. This is my frost flowers and leaves blocking. I have never seen a frost flower, and have little notion of what they are, but I imagine if I ever see anything cold that resembles this, I'll know. 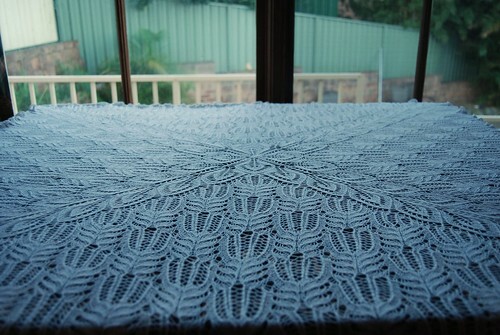 Because, you see, Frost Flowers and Leaves has five rows on the final chart before the edging still to go. And, somehow, by taking my eye off the ball for two side repeats, I managed to completely fubar the faggotting. So, when I can stomach it, I need to remover the lifeline and rip out two rows of the knitting, and somehow get them back on the needles. But it won't be this day. This day, I'm going to have to do something else to take my mind off this disaster. Like start organising my new STUDIO room !!!!! oh wow. You are doing some amazing work! 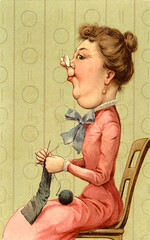 I've long enjoyed your lace work. 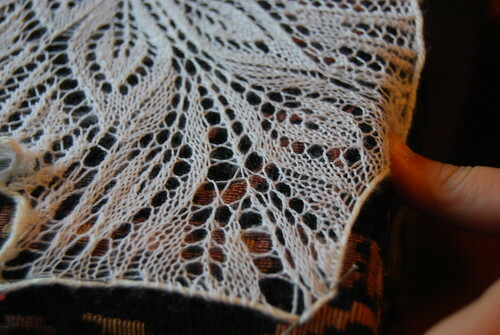 When I look at that beautiful lace, it is hard to believe it could exist outside Nature. But it does. How lovely!!! 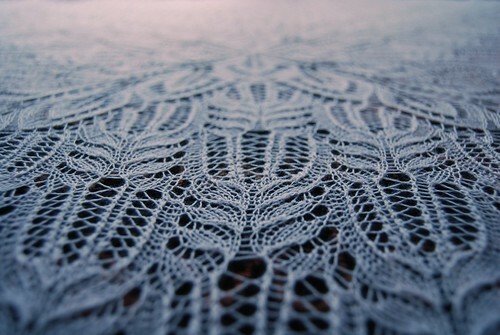 It's gorgeous - I love the beautiful lace. You have done such a great job. Wow, look at that lace. I think I'd just leave it on the table like that forever. So beautiful. And new studio - sounds very promising. I just want to give that dog on the couch a big tummy rub. so cute. I can't actually see the problem in the lace but will take your word for it that it's there.